Have I yet bored you by retelling the story of how I was once a bingo parlor hostess in England? Oftentimes, when I trudged home from the bingo, I would stop at the local fish-and-chips shop and get a paper cone full of fried things doused in salt and vinegar for my all-beige dinner. Sometimes, I didn’t even bother with the protein-packed fish: Just the straight chips, please. And they were delicious. So I feel for Europeans facing this distressing news today: Due to some horrendous weather, including a summer-long drought, The Washington Post reports that European chips are set to be an inch shorter than usual: “Frites, chips, fries, whatever Europeans want to call them—they’re shrinking.” The chips are usually about three inches long, but they’re about to lose an inch or so. According to Pierre Lebrun of the Walloon Potato Growers’ Association, “Crop yields this year are down by 25 percent from normal and the tubers are smaller,” leading to smaller product. This is tough news for Europeans who depend on those paper cones as much as I once did. 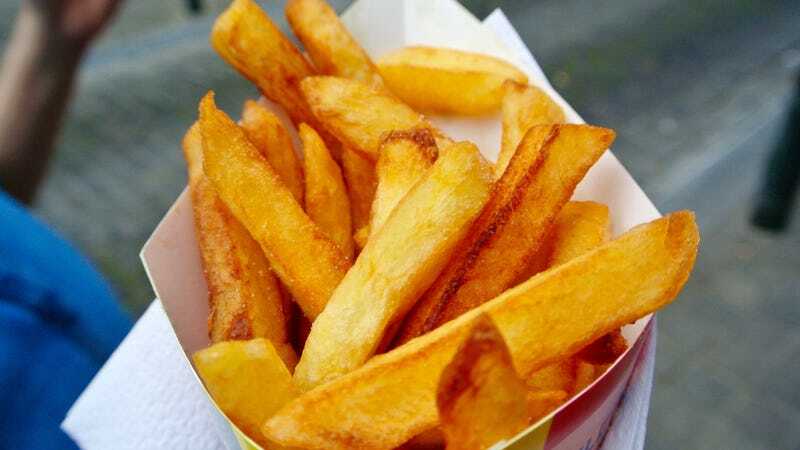 The Post notes, “To get a sense of how integral fries are to cultural life in Belgium, consider that there are almost 5,000 fry kiosks in this country of 11 million people.” I guess shorter is better than no chips at all—a terrifying consequence that even as a former European, I refuse to contemplate. Hey Nicholas Sparks, is a hot dog a sandwich?